Mitt Romney says a lot of questionable things on the campaign trail, like taking credit for the auto bailout he criticized or pretending that he never touted his Massachusetts health care law as a model for national reform. But one of the most dubious claims he’s making isn’t a disprovable statement of fact. It’s a theory about the economy—one that I suspect the majority of economists, including many conservatives, would reject. The consequence is that we are enduring the most tepid recovery in modern history. The consequence is that half of the kids graduating from college can't find a job that uses their skills. Half. The consequence is that retirees can no longer get by on savings and Social Security. The consequence is that the length of time it takes an unemployed worker to find a job is the longest on record. Note the way Romney establishes cause and effect here: Obama’s contribution to higher deficits are the reason more people can’t get work and more seniors can’t make ends meet right now. This is an audacious claim and, while I'm no economist, I'm pretty sure it places Romney on the outer edges of the debate among mainstream scholars. I know of serious conservatives who think the Recovery Act, which has increased deficits temporarily, didn’t ultimately do much to create jobs in the near term. And I know of serious conservatives who think that creating jobs now wasn’t worth the long-term downside of adding to the federal debt, however incrementally. Both viewpoints seem to represent minority views, if a recent University of Chicago survey of leading economists is indicative. But the arguments have at least some logic to them. But Romney's suggestion that unemployment today is a consequence of Obama's contribution to the deficit (real or imagined) requires further leaps of logic. You’d have to argue, for example, that extensions of unemployment benefits have reduced incentives to work (despite research to the contrary) and that such negative effects substantially outweigh the positive effects of traditional stimulus measures. It’s not impossible to make this case. I think Casey Mulligan, also of the University of Chicago, has written things along these lines for the New York Times. But, unless I'm missing something, that argument is even more marginal than suggestions the Recovery Act didn’t help at all. 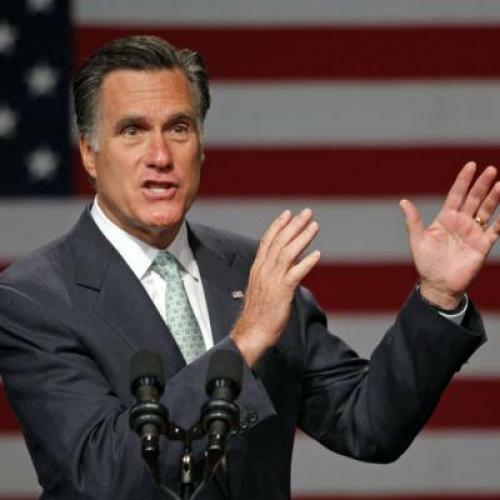 Sometimes unpopular theories are correct and, for all I know, Romney really believes what he is saying. But I suspect Romney’s calculus here is more strategic than economic. Romney's chances of winning the election are good if he can convince people that Obama didn’t do enough to help the economy. But Romney's chances are a lot better if he can convince people that Obama actually hurt the economy. Not only would that make voters less enthusiastic about Obama. It would also distract them from the fact that Obama inherited a mess from his Republican predecessor—and that Romney, himself, has not offered much of an alternative. By the way, the speech wasn't Romney's only major statement on Tuesday. The campaign also released an advertisement, also targeting Iowans, making a similar case as the speech. It's an effective ad, shot like a documentary and focusing on individual Iowans who can't find work. But Greg Sargent had the good sense to check out the facts of the stories, which turn out to be a great deal more complicated than the advertisement suggests. Update: With some tweaks to language, just to make clear that, as a non-economist, I'm relying heavily on what the profession thinks. Also, I added a reference to the Center on Budget's analysis of the deficit and what created it. They also produced the graph below, which, I think, paints a pretty clear picture of who's responsible and who isn't.